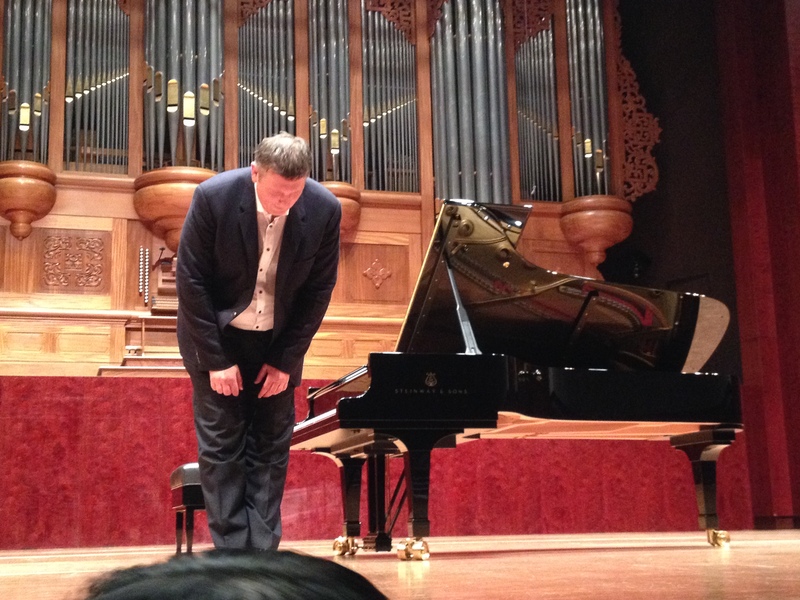 Oftentimes the most enjoyable part of a piano recital comes at the end when the performer has finished their conracted work, unbuttons their shirt collar, so to speak, and offers a few encores for the audience’s delight. We heard Debussy Reflets dans l’eau, from Images, followed by 3 Debussy Preludes (La Fille aux cheveux de lin, Puerta del vino and La Danse de Puck) and rounded off with Ravel’s Ondine. The pianistic colours were fluent and soothing, the audience gave a standing ovation, and the encores rounded off an enjoyable evening. The recital had opened splendidly with Liszt’s transcription of Bach’s organ Prelude and Fugue in C BWV 547, the pianist playing from the score, and the interpretation breathed very nicely and organically. It was somehow appropriate that the organ in the National Concert Hall was looking so handsome as a backdrop to the piano on stage. The Schubert song transcriptions which followed also fared very well, the phrasing was natural and buoyant, with the changes of mood which characterise Schubert’s songs nicely done. The instrument, a shining Steinway concert grand, sounded very well, also in Sposalizio which followed, from Annees de Pelerinage book 2. The main body of the recital consisted of Liszt (Etudes Gnomenreigen, Un Sospiro, La Leggierezza) and Rachmaninoff (Etudes Tableaux and the mighty 2nd Sonata). Here too, the physical virtuosity and strength of performance was never in doubt, with well prepared, punchy pianism and scarcely a wrong note. However, this does not necessarily mean that music-making took place. Listening to the centre of the recital felt rather like being strapped in to an express train travelling at top speed. Rests were abbreviated throughout, crescendos were often rushed to the point of losing rhythmic definition (Gnomenreigen), the sound was over-percussive and often forced or one-dimensional (Etude Tableaux Op 39:5); the rhythm was not alert or crisp (Rachmaninoff Op 39:4). Overall I had the sense that the pianist had performed these works too many times over the past 20 years.